This guide is for the PlayStation game. For the first game in the Ace Combat series, see Air Combat. 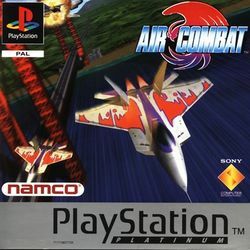 Air Combat (Ace Combat in Japan) is a semi-realistic flight-sim/action game, developed by Namco and released in 1995 for the PlayStation. Air Combat is also the arcade game from Namco in 1992 that simulates an F-16. The game mainly involves dog fighting and has three levels of play: Cadet, Captain and Ace. This game was the predecessor of the PlayStation series. It had an arcade sequel, Ace Combat 22. The story begins when a terrorist force starts an uprising and inflicts massive damage across an unnamed country. Efforts to defeat these terrorists through conventional means failed and the situation turns desperate; in response, a mercenary air force has been assembled to take the fight to the enemy and free the nation from the terrorist forces. This page was last edited on 2 April 2014, at 17:17. This page has been accessed 3,709 times.